← Art and Tech Part 3: Can We Know the Dancer from the Dance…? What Daniel Defoe depicts in Moll Flanders is the story of a person who lives purely for pursuit of “the main chance”: accruing wealth at the cost of family, friends, self-respect…in the hope that once one has “a stock” there will be time for reflection, repentance, reclamation…. I went off the 2014 reading (updated) list(s) for this last “non-holiday” themed book as a result of some comments on the first of my “art and tech” series of essays. An argument advanced by a commenter whose opinions I value and whose friendship I treasure suggested that the only reliable arbiter of human achievement is the marketplace – and argued, at least indirectly, that economic success = validation of one’s efforts. I freely admit that I find such arguments about how life and life’s work should be valued, and they are numerous in these times, troubling. I find them most troubling because, given the amorphous nature of human culture and its values, this may very well be the view that most people choose to adopt. When I feel troubled by issues of this sort, I turn, as I have for many years, to literature. When I go to literature I am seeking, not answers of the smug and certain sort constantly promulgated by news outlets both left and right. Instead, what literature gives me is perspective – the perspective of fellow artists as well as in most cases (since my penchant is for classics of the canon), historical perspective. This being a troubling question about whether economics should be the most important criterion for making life decisions, I turned to that most economics based of literary works, Moll Flanders, written by that most entrepreneurial – and economically unpredictable – of authors, Daniel Defoe. The position of women in Defoe’s society was difficult (I know, when has the position of women in any society not been difficult?). Their career (and therefore, economic advancement) options were limited to a few predictable choices: marriage, “genteel” professions such a working as a governess or companion to an elderly lady, giving lessons (usually in one of the “refinements” such as music, drawing, or fine sewing/embroidery), or “common” professions such as entering service. There were also other professions, of course – including the world’s oldest, as it has been called, and crime, generally forms of theft such as shoplifting or picking pockets. What there are not, in Moll’s time (the latter half of the 17th century) are an adequate number of social institutions to help the vast numbers of disadvantaged get a decent start in life. 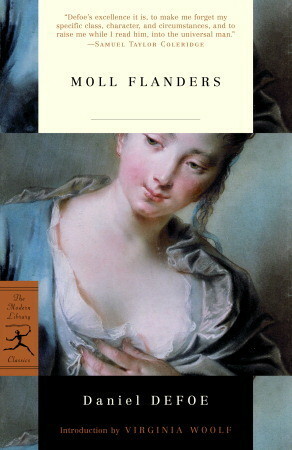 Moll is such an unfortunate, born to a mother convicted of petty theft (one notes early reading the novel that criminal punishments are severe for even the smallest of crimes – in fact, punishment is based on the value of the stolen property) who “pleads her belly” (uses pregnancy) to avoid deportation to the colonies in “Virginia” until her child is born. Once Moll is born, (in Newgate Prison) however, her mother is deported and forced by law to leave her daughter in the care of – whoever will take her. Moll (the name she is known by in her criminal period – the only other name we know her by is “Mrs. Betty” – which may or may not be an alias). Moll is fortunate first to fall into the hands of a kind woman whose profession is to prepare “orphans” such as she to find “honest work” such as I have described above. The child Moll is a bright, sensitive – and ambitious. But, contrary to the expectations for one in her position, she does not want to go to service. A chance meeting with the wife of the mayor who takes a liking to Moll’s pretensions to being a “lady” (visiting among the “unfortunates” was a common amusement for bored wives of the wealthy – remember, the mental institution known as Bedlam once offered guided tours for the well-to-do, not unlike zoo visits) leads to visits from other well-to-do ladies. Into one of these ladies’ families she is brought as a companion for the family’s daughters. There are also two sons in the family – and as Moll, or Mrs. Betty as she is known in this period, matures into a strikingly lovely young woman, there is bound to be trouble. And there is: Moll becomes the mistress of the elder son (who, to achieve his ends has promised marriage – hence, economic security); the younger son, established as a lawyer, asks her to marry him. a Man in a hurry of publick Affairs, and getting money, seldom at home, thoughtful of the main Chance…. Moll, at this point still something of a naif, refuses the younger son’s proposal because she believes the elder will keep his promise to marry her. She is disabused when he pleads with her to marry his brother – and offers to aid her in tricking him so that he does not find out that she is not a virgin – and therefore “damaged goods.” (Ah, that economic measurement again.) Eventually, the family agrees to the marriage – between Moll and the younger son. So Moll enjoys a few years of economic security. But then her husband dies unexpectedly. And Moll, while left with “a stock,” (estate) as she calls it, feels insecure. She rushes into a marriage with a handsome spendthrift who ruins them both financially. So, with only a “small stock,” she meets a man from the American colonies who marries her, again in spite of her “lack of prospects,” and takes her off to Virginia where he has plantations and she is economically secure again. There she meets his mother – and discovers, in conversation with her one day several years and a couple of children later – that her mother-in-law is also her mother. So certainly does Interest banish all manner of Affection, and so naturally do men give up Honour and Justice, Humanity, and even Christianity to secure themselves. The two split up each wishing the other the best of luck. Moll, however, has another plan: she has a banker on the line whom she has strung along as he was completing his divorce from a wife who’d run off with someone else. Unfortunately, her handsome rogue of of a highwayman husband has left her pregnant. She hides this from the banker, “disposes” of the child (a chilling facet of Moll’s story is the ease with which she shifts her children off onto in-laws, friends, even strangers, whoever shows an interest in them – possibly a result of her own traumatic childhood), and marries him. …there are Temptations which is not in the Power of Human Nature to resist, and few know what would be their Case, if driven to the same Exigences… Thus the Devil who began, by an irresistible Poverty, to push me into this Wickedness, brought me to a height beyond the common Rate, even when my Necessities were not so great…. But always comes the fall, and Moll is finally apprehended for theft – theft which in strictly legal terms she has not committed. Then it is back to Newgate Prison, to end her days, it seems, where she began them. While awaiting sentence (and expecting to be hanged), she meets her highwayman husband. Their reunion – and eventual transportation to Virginia once a helpful minister has gotten her execution commuted – brings her back to her family there. Her husband/brother is a senile old man, but one of her children with him, a son, is overjoyed to see his mother again. Moll is at pains not to reveal the scandalous relationship to her highwayman husband, but she also wishes to “pursue the main chance“: her mother has left her an inheritance. She cultivates her relationship with her son/nephew and eventually works matters out so that she gets the profits from her mother’s plantations. Her husband/brother conveniently dying, she is able to produce her highwayman husband as her “new” husband and gain the approval of her son. resolve(d) to spend the Remainder of our years in sincere Penitence for the wicked Lives we have lived. But as to whether there is value in valuing “the main chance” above all else, Defoe seems slightly ambivalent. His pen made him quite a bit of money, but he died of a stroke even as he continued to dodge creditors because his relentless need to speculate to improve his “stock” saw him repeatedly overextend himself. So, do I take a lesson from Moll – or her creator? Is Defoe’s sad end the lesson? Or Moll’s repentance? And what is Moll repenting? Having sold herself and engaged in crime? Or having spent her life in pursuit of money to the near exclusion of love and happiness from family and friends? Is it about what we accrue? Or who we become?